Equilibrium, kinetics and thermodynamic studies on the removal of Acid Red (AR88) using Ulva reticulata have been investigated. In batch experiments, the parameters studied included the effect of the dye concentration, temperature, contact time, adsorbent dosage, pH. The pseudo-first-order and pseudo-second-order kinetic data were tested with experimental data. The optimum conditions were: pH 5, temperature 30ºC, biomass size 0.5 mm and maximum metal uptake was 75.4 mg/g .Various thermodynamic parameters such as ∆Hº, ∆Gº and ∆Sº were calculated indicating that the present system was spontaneous and endothermic process. The pseudo first and second order kinetic models were also applied to the experimental kinetic data obtained during Biosorption of AR88 and High correlation coefficients with low standard deviations favor the pseudo-second-order model for the present systems. The ability of Ulva reticulata to Biosorption AR88 in a packed column was investigated, as well. A glass column was used to conduct the experiments. At 20 cm (bed height), 5 ml/min (flow rate) and 100 mg/L (initial concentrations), ulva reticulata exhibited AR88 uptake of 88.65 mg/g. The Thomas model was used to predict the breakthrough curves. Bilal, "Batch kinetic study of sorption of methylene blue by pertile," Chem. Engg J., vol. 102, pp. 73-81, 2005. F. Kargi, "Biosorption performance of powdered activated sludge for removal of different dyes stuffs," Enzyme Microbiology and Technology, vol. 35, pp. 267-271, 2004. I. Kiran, "Biosorption kinetics and isotherm studies of acid red 57 by dried cephalosporium aphidicola cells from aqueous solutions," Biochemical Engineering Journal, vol. 31, pp. 197-203, 2006. 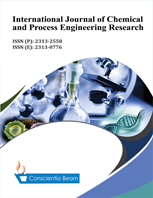 J. Y. Farah and N. S. EI-Gendy, "Performance and kinetic studies on biosorption of astrazon blue dye by dried biomass of baker’s yeast as low cost biosorbent," Bioscience Biotechnology Research Asia, vol. 4, pp. 359-370, 2007. D. T. Sponza, "Toxicity studies in a chemical dye production industry in Turkey," Journal of Hazardous Materials, vol. 138, pp. 438-447, 2007. G. Mckay, "Equilibrium studies during the removal of dyestuff from aqueous solution using bagasse pith," Water Res., vol. 21, pp. 1513-20, 1987. Da Coasta and De Franca, "Biosorption of zinc, cadmium, and copper by brown seaweed (Sargassum sp.) in a continuous fixed-bed laboratory reactor," Bioseparation, vol. 6, pp. 335-341, 1997. O. Gulanz, A. Kaya, F. Matyar, and B. Arikan, "Sorption of basic dyes from aqueous solution by activated sludge," Journal of Hazardous Materials, vol. 108, pp. 183-188, 2004. T. Vijayaragavan, "Fungal decolorization of dye wastewater; a review," Biores.Technol., vol. 79, pp. 251-262, 2004. Y. S. Ho, "Regression analysis for the sorption isotherms of basic dyes on sugarecane dust," Bioresourse Technol, vol. 96, pp. 1285-1291, 2005. N. Tewari, P. Vasudevan, and B. Guha, "Study on biosorption of Cr (IV) by mucor hiemalis," Biochemical Engineering Journal, vol. 23, pp. 185-192, 2005. T. V. N. Padmesh, "Biosorption of basic dyes onto azolla filiculoides; equilibrium and kinetic modeling," RPCES, 26-27 July 2006.